David Mackenzie’s neo-western Hell or High Water isn’t the first film to open with a bank robbery, but it may be the first where a hoodlum makes a 'that’s what she said' gag en route to a heist. There’s a richly comic vein of juvenile banter running through this muscular crime thriller, which boasts a livewire Ben Foster performance and a social conscience rare for the genre. Set in and around a handful of backwater Texas towns, it’s a cynical and somewhat satirical western for a post-war on terror generation where banks and their morally bankrupt practices have left homes abandoned and businesses shuttered (a prequel might be called How The West Was Lost). Chris Pine plays modern day Robin Hood Toby – a criminal with a code who only steals from one specific bank chain, refuses to kill and claims to be doing it all for his two sons. Tanner (Foster) is the polar opposite, lacking Toby smarts but compensating for it with fire-behind-the-eyes insanity and a sincere love for his little brother. Neither are in it just for the money; for Tanner the rush is enough, while Toby has more noble intentions. In parallel to the brothers’ crime spree Jeff Bridges plays Marcus, a Texas ranger days away from retirement. Together with his partner Alberto (Gil Birmingham) they follow the clues, Marcus’s years of experience giving him a near preternatural ability to predict the brothers’ next move. Bridges brings gusto and his trademark crusty humour to a role that, for the most part, simply requires him to sit around restaurants and in cars bickering about T-bone steaks and sartorial choices. He’s huge fun, Birmingham the perfect deadpan foil for Bridges’ constant jibes as the pair relentlessly mock each other in a way that conveys affection and friendship, just like Toby and Tanner. 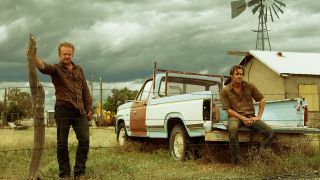 Writer Taylor Sheridan penned last year’s sizzling Denis Villeneuve thriller Sicario, which also played at Cannes, and his script here is another major success. There’s a satisfying complexity to characterisation – no one is surface-level simple, heroes and villains are rarely clear cut. If there’s a bad guy it’s a nebulous one: Big Money. As a result it’s not always obvious who to root for: the brothers are on the wrong side of the law, but for the right reasons, while Bridges’ sheriff has authority on his side, but in his relentless drive to hunt the brothers down like dogs it questions who really has the moral high ground. When the action comes it’s small in scale, but tense and exhilaratingly violent. Toby has their bank-robbing technique down to a science – turn up first thing in the morning, only steal small denomination notes from teller drawers so they can’t be traced, bury the car after each getaway. Naturally things don’t always go to plan, one midday standoff with a bank full of customers is nerve-frayingly fraught, while Mackenzie (who made 2013’s superb prison drama Starred Up) keeps the numerous high-speed pursuits engaging with a camera the swoops in and out of the action. It also has an impressive sense of place, with endless plains and dusty roads that wind though green hills and dusty canyons. The world feels small, but with reason: for many, life in the west is no longer tenable, the underpopulated towns giving the story a clearer focus and the film its own feel. It’s powered by a superb, sombre Nick Cave and Warren Ellis score that recalls their work on The Assassination Of Jesse James By The Coward Robert Ford and The Proposition – a film of similar complex morals. The performances are uniformly excellent, a finely balanced triple-header. Under the grime and stubble Toby is the more straightforwardly virtuous of the three, Pine downplaying the character’s square-jawed potential, while Marcus is the kind of borderline-racist sheriff with a dogged devotion to the law who’s a western mainstay, Bridges no less fun because of it. Tanner is the wildcard, Foster perfectly cast as the larger than life lunatic. Prone to bursts of explosive violence and manically unpredictable, he’s in it as much for the adrenaline-thrill of the heist as he is his dedication to his brother. Dialled all the way up to 11 on the whackjob scale, but confident, capable and oddly comfortable with his place in the world, he’s reminiscent of GTA 5’s Trevor. If a Los Santos-set movie ever happens, he’ll be a shoe-in.